Not all socks are the same, and when it comes to running socks, a good pair of technical ones will make all the difference. Keeping your feet dry and comfortable will not only reduce your risk of blisters but keep you running confidently. Here's how to choose the best running socks for you. Whatever style and fit of running sock you choose, making sure you're wearing the right fabrics is vital. While you might think regular cotton sock will do, cotton fibres actually hold moisture, trapping it against your skin, causing coldness in winter, and blisters in summer. Using technical fabrics instead, transport the sweat away from your skin. Regardless of the fabric you choose, you should always wear a pair of fresh, dry socks for every run. 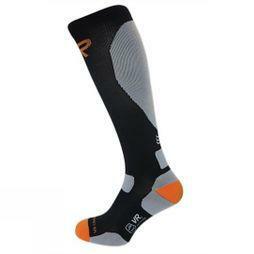 You can also use technical socks for gym work, aerobics, spin class and other high-output exercise. Using superior natural fibres such as merino wool are ideal for running socks. Not only are they naturally breathable and sweat-wicking, but they're anti-bacterial too leaving you without the stink. Polyester and nylon are popular synthetic fibres for running socks as they're both sweat-wicking, breathable, and more durable than cotton. Running socks are designed to keep the feet dry and comfortable; seamless construction is ideal as less chafing means more comfort. Whether you choose thick or thin socks depends on personal preference as both have their pros and cons. Remember that the thickness of your sock can affect the responsiveness of your running shoes so make sure you try them on together before buying. Many running socks are designed to gently compress your muscles to improve blood circulation, reducing tiredness, and boosting recovery time keeping you running further, for longer. These can be knee length to cover your calves or shorter, ankle length, for just your feet. Look out for extra padding across the toes, heel, and ball of your foot to help minimise shock and protect high impact areas from blisters. Elasticated material such as Lycra is often used to keep the sock in place when running as well as support the arch of the foot. The same material is also used to grip the ankle, providing extra support for a comfortable run. Blistering can be a runner’s worst nightmare, especially out on a long run. Some technical running socks use a two-layer system to help prevent blisters as the potential for friction is reduced by the two layers of material moving against each other, rather than against your skin. The only downside is that antiblister sockscan be less ventilating and breathable than regular running socks causing your feet to overheat. Socks designed specifically for your left and right feet can help give you maximum comfort and fit. Some running socks styles feature fluorescent colours and reflective bands, ideal for low light conditions or running in the dark. With so many to choose from buying running shoes can be a daunting task but we're here to make it easy. Just follow our handy guide to find out what questions you need to be asking, and what it all means. Road running shoes are the most common type of trainers and are usually what most people think of as 'running shoes'. They're designed to be highly shock-absorbant to help protect your joints against the impact of harder surfaces, reducing the risk of injury and giving you a more comfortable ride.